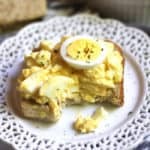 When I need an easy meal, I’m going with these Classic Egg Salad Sandwiches. 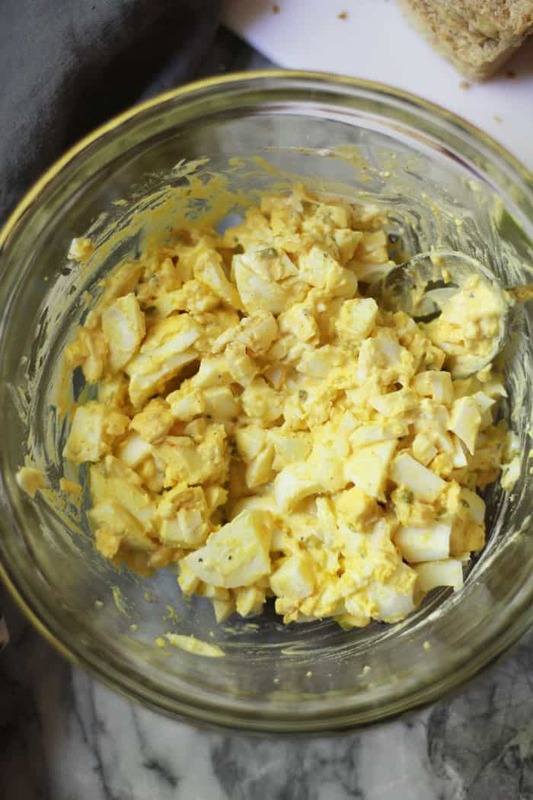 Eleven minutes to boil the eggs, and then just a few more to make the egg salad. Yes please! Eggs have always been my go-to when I’m short on time. Fueling three hungry men is no easy task, so I’ve gotta pump up the protein. Breakfast tacos, frittatas, poached egg avocado sandwiches…as long as it’s got in an egg in it, I’m all about it. Do you struggle boiling eggs? Here’s my fool-proof method, and tips. Gently place eggs in a stock pan. Cover with water and add a big shake of either salt or baking soda. Secure lid on top. Turn burner to high and bring eggs to a boil. Don’t lift lid. When eggs reach a boil, turn burner off and set timer to 11 minutes. Leave pan on burner with lid on securely. After timer beeps, place pan in your sink, and run cold water over the eggs. Let the eggs sit for about 10 minutes. Remove eggs to dry towel on counter. Peel eggs. The shell should come off very easily. Note: If your eggs are very fresh, they won’t peel well. 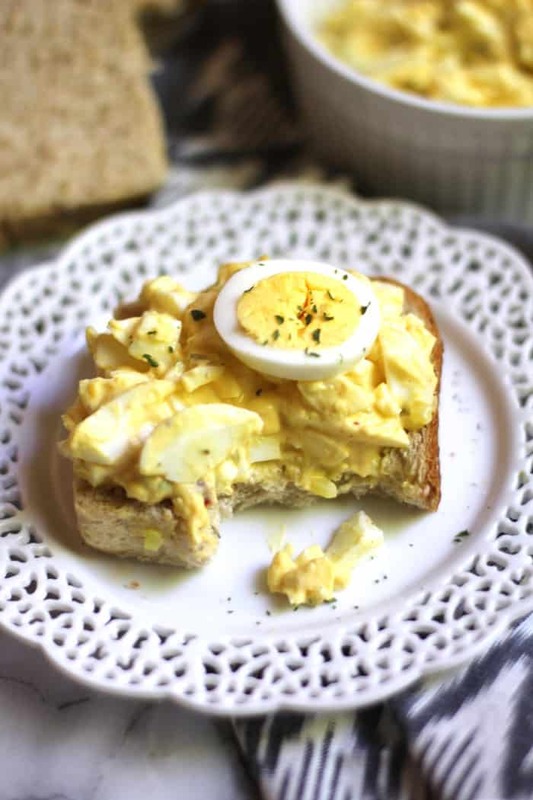 It’s best to use eggs that you’ve had in your refrigerator for awhile. This recipe is super easy, and it’s sweet and slightly tangy all at once. You probably have all the ingredients at home already. BTW, I used my homemade Cracked Wheat Bread. It’s my mom’s recipe and I pretty much lived on it when I was a senior in high school. There are so many variations of this salad. You could sub out the mayo and just use mustard, or a combo of avocado and mustard. Don’t like sweet relish? Use dill relish or dill pickles. If you prefer Dijon mustard, use that instead of yellow. Play around with the spices and come up with your own favorite combination. That’s what I love about simple recipes. You can adjust it to YOUR liking. 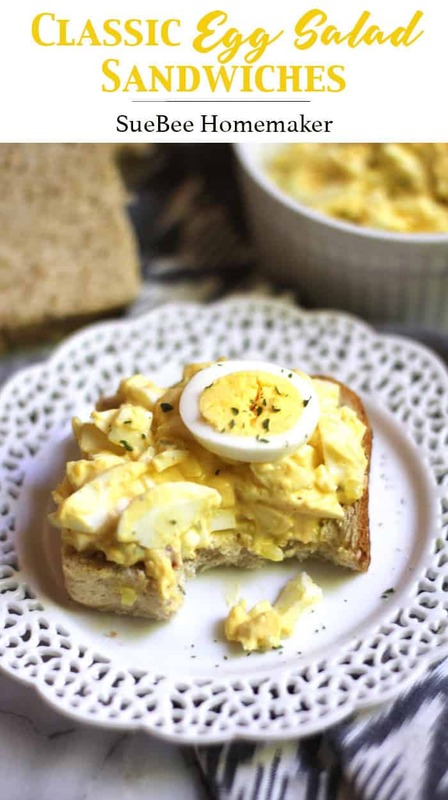 Classic Egg Salad Sandwiches are a simple combination of eggs, mayo, mustard, sweet relish, and a few spices. So easy, so good! Boil eggs. 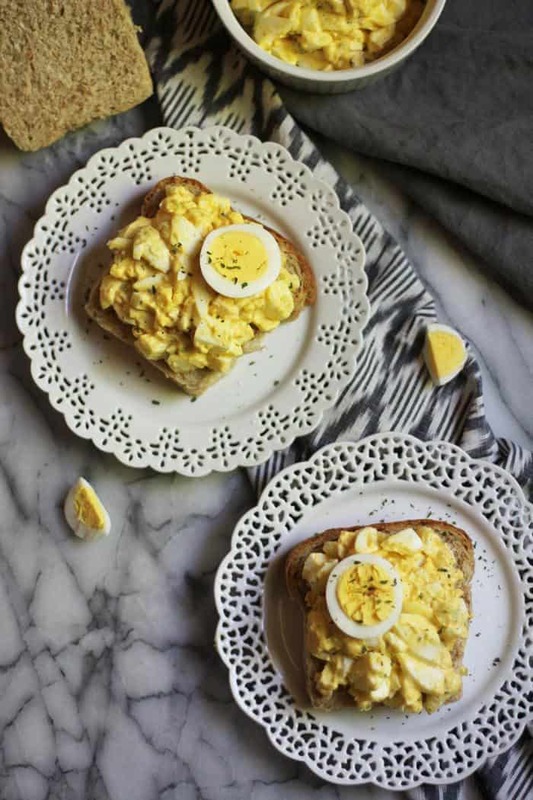 Place eggs in stockpot, cover with water, and a generous sprinkle of salt or baking soda. Cover and bring to a boil. Turn of burner but leave pan with the lid on. Set timer for 11 minutes. Remove pan and run cool water over eggs. 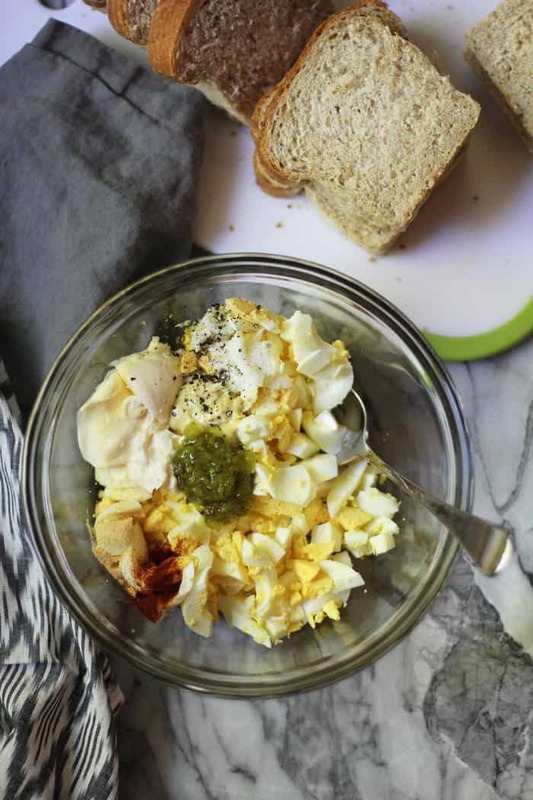 When eggs are cooled, rough chop them, and add to mixing bowl. Add the mayo, mustard, relish, and spices. Serve on crusty bread (of your choosing), and a sprinkle of parsley. I love so much about this recipe. It tastes incredible and my favorite time to eat it is on the weekend for lunch. It is filing and refreshing at the same time. I also love that it has less than ten ingredients and is under 300 calories. Score!